For most of us the enjoyment of Christmas Day is not governed by what happens on a rugby field a couple of nights earlier. If you happened to be one of those on that pitch however - in this case the Sportsground, in front of a packed house - then tomorrow morning you'll either be looking forward eagerly to the rest of the day, or else hoping to fast forward to the new year to put stuff right. So for the Ulster lads there won't be much festive cheer. They were blown off the park in record style by a Connacht side playing their best rugby of the season if not the calendar year. Their pace, aggression and accuracy was first class. Having lost their last two Guinness PRO14 games - to Zebre and Cardiff - before beating Brive back to back in Europe the prospect was unappealing of Kieran Keane having to explain again why the gap between training field and playing pitch was a black hole for his team in this competition. So we were spared that. As was he. Instead the crowd of 7,629 were running through their repertoire of Christmas ditties long before the finish on what for them was a special night. As for Les Kiss, that his team had been on a bit of a roll - true, there had been some pitching from side to side involved - since losing to Leinster in October didn't mean there was any room for coming to a halt. But it was a shuddering one. Losing second row Matt Dalton before kick-off should have been no more than a speed bump to their preparation. And perhaps it was, in which case there had to be a better reason for a start where they looked badly rattled. Playing with the breeze in the first half, blowing towards the College Road end, they were 12 points down inside eight minutes. And it could have been worse. Indeed they could easily enough have been five tries down by the break, so when Jack Carty tapped over a penalty with almost the last kick of the half - they had been pounding away for the previous three minutes in search of a fourth try - they looked peeved that they weren't taking a bonus point with them to the changing room. The game hadn't been three minutes old when virtually the first time Ulster touched the ball was to restart after Eoghan Masterson's try from a mauled lineout. And they didn't get that one back. Then, less than five minutes later, O'Halloran countered well, found man of the match Matt Healy outside him with the perfect line and pace. It all happened so fast Ulster couldn't get their defensive line set properly and Kieran Marmion shot through the hole on the side of the ruck and combined with Bundee Aki for the centre to score. It was a thrilling try, greeted as you would expect by the Clan Stand faithful who shook the structure to its foundation. 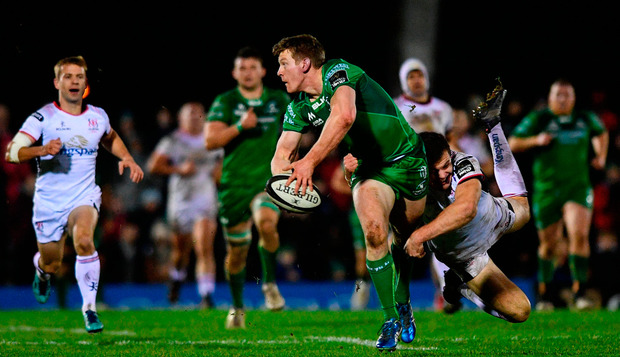 John Cooney pulled three points back for Ulster on 23 minutes after Connacht dropped a maul, but when they went in search of territory just after the restart they were in trouble again. And again it was O'Halloran, stepping in and out of three tackles before scoring with a shove over the line that needed confirmation from the TMO. Carty missed the extras before, along with Cooney, tacking on another three before the break. It wasn't as good as it might have been but still it was a substantial lead. And between the wind, and an increasing advantage in the scrum where referee Mike Adamson was reflecting their dominance with his decisions, Connacht had all they needed to finish the job. Then they got a bit more: two yellow cards in their favour - the first for Andrew Warwick for a team offence close to the line, followed by Louis Ludik for slapping down a pass in the same area. With Ulster down to 13 men the bonus-point try was like night following day, with Ultan Dillane getting over from close range. He was followed over in the same corner on the hour mark by Jarrad Butler. Craig Gilroy and Rob Lyttle both got over for Ulster in the final quarter. 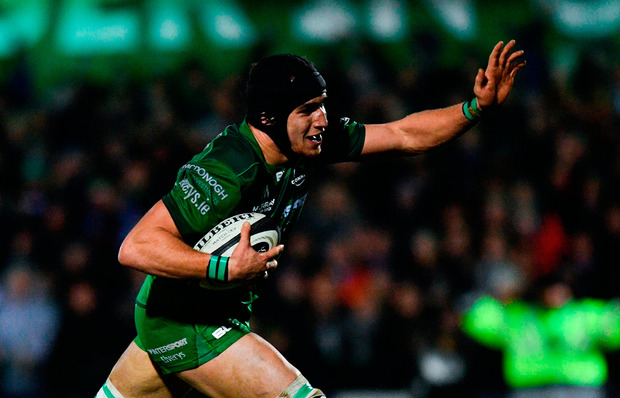 But so did Dillane again, for Connacht's sixth try. Scorers - Connacht: U Dillane two tries, E Masterson, B Aki, T O'Halloran, J Butler try each, J Carty 2 pens, 4 cons. Ulster: J Stockdale, R Lyttle one try each, J Cooney 2 pens. Connacht: T O'Halloran; N Adeolokun (D Leader 64), B Aki (E Griffin 64), T Farrell, M Healy; J Carty, K Marmion; D Coulson (P McCabe 56), S Delahunt (T McCartney 56), F Bealham (C Carey 56), U Dillane, Q Roux (J Cannon 57), E Masterson, J Muldoon (capt), J Butler (N Dawai 61). Ulster: J Stockdale; C Gilroy, L Ludik, D Cave, A Trimble (R Lyttle 52); P Nelson (J McPhillips 65), J Cooney (P Marshall 62); A Warwick, J Andrew (A McBurney 45), W Herbst (R Kane 48), I Henderson (capt), R Diack (M Rea 58), C Ross (S van der Merve 49), S Reidy (G Jones 36).